It's the Last Month for the Rothman Institute Ice Rink! You have until February 26 to glide across the ice right next to City Hall! The rink's open seven days a week, with extended hours on Presidents' Day (February 20), 11am-9pm. Admission is $3 for children ages 10 and under and $5 for adults. Skate rental is $10. Visit DilworthPark.org/rothmanicerink for rental information and more. The Rothman Institute Cabin is Open All Month! Also open through February 26 is the toasty warm Rothman Cabin, on the northern end of the rink! Warm up with hot seasonal cocktails and an artfully-crafted menu from the Air Grille by Brûlée Catering. Adults 21 and over can enjoy a glass of wine, a specialty cocktail featuring Jim Beam, or a Sam Adams craft beer starting at 5pm on weekdays, and 11am on the weekends. Plus, there are great specials during NFL post-season games! DilworthPark.org/rothman-cabin. There's still time to book a winter event at The Rothman Institute Ice Rink and Rothman Cabin! From corporate parties and cocktail receptions to team-building activities, school groups and fundraisers, the twinkling holiday lights and bustle of Center City make Dilworth Park the perfect backdrop. For more information, or to book your special event, email rentals@centercityphila.org or call 215.440.5507. Dilworth Park Café and Air Grille now have a rewards program and gift cards! Earn a point for every dollar you spend at either location. These Dilworth Perks can be earned and redeemed at both Dilworth Park Café and the Air Grille in the Rothman Cabin. That means you have more options! Visit the café's Facebook page for details. Enjoy this winter edition of Center City District Sips in the Rothman Cabin with $5 cocktails from Jim Beam and Effen Blood Orange, $4 wine and $3 Sam Adams drafts, along with specially-priced food items from the Air Grille. Buy one admission and get one free to skate with your sweetheart to love songs new and old. Remember this special evening with a rose and a keepsake photo. Make-and-take Valentines and special chocolate treats will be available inside the Rothman Cabin. Special rink admission pricing cannot be used in conjunction with other offers. Partners: Subaru, Cardiology Consultants of Philadelphia and SEPTA. The Rothman Rink is accessible for everyone again this season. With sled skating, adults and children with disabilities can reserve a sled to use during this scheduled session. Reservations required. For questions about this program or to reserve a sled, email sleds@rinkmanagement.com. Presented by Magee Rehabilitation Hospital. Join PGN and Delaware Valley Legacy Fund for Skate.Pride.Love, a special evening to celebrate love and acceptance with entertainment, skating and giveaways. A portion of the proceeds will benefit the Delaware Valley Legacy Fund. Click here for tickets. There's one more month to enjoy the special garden on the Greenfield Lawn, created in partnership with Greater Philadelphia Gardens. Children and adults will delight in discovering picture-perfect moments amid the vibrant plantings, topiaries, twinkling lights, and décor that showcases all 32 public gardens, arboreta, and historic landscapes that are located within 30 miles of Philadelphia. Anchoring the center of the maze is a welcoming gazebo. Feeling garden inspiration while visiting the Wintergarden and the America's Garden Capital Maze? 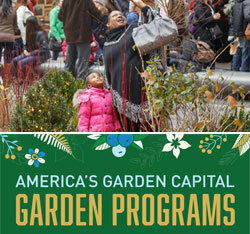 This winter, join America's Garden Capital for a variety of gardening programs that will have you dreaming of spring! Learn how to combine seeds, clay, and compost into small balls perfect for sharing with your Valentine. Together you can plant these seed bombs anywhere that needs an extra burst of flowers. Learn how to create beautiful and blooming accessories during this hands-on workshop. Show your Valentine extra love by creating a legendary arrangement that would make Cupid proud. Lucky participants will leave with the arrangements created during the workshop. Get a jump on Spring! Learn the basics of starting seeds indoors and out. Participants will take home some seeds to get your garden growing. Logan Square Café, 8am-2pm, seven days a week.